In images, majestic volcanoes rise from the edge of inky waters; the lake appears mysterious, haunting. The deepest lake in Central America, Atitlan had been described by friends as a vortex, a portal, the bellybutton of Mayan civilization. Lake Atitlan in Guatemala was a place I had always longed to visit. In images, majestic volcanoes rise from the edge of inky waters; the lake appears mysterious, haunting. The deepest lake in Central America, Atitlan had been described by friends as a vortex, a portal, the bellybutton of Mayan civilization. 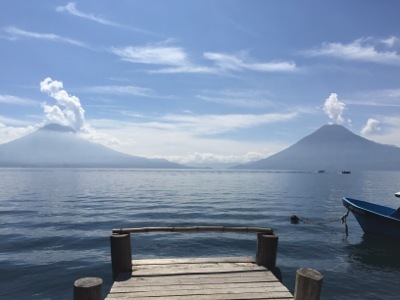 So I only hesitated for a moment when my friend Alison, a Chicago-based art historian and fellow yogi, suggested I accompany her over the holidays on a yoga vacation at an upscale retreat center on Lake Atitlan. I was a little apprehensive about going to Guatemala because of the country's high violent crime rate, but I'd been warned about Brazil, too, and a recent trip there was as cool as a Jobim bossa nova and totally without incident. I am, after all, a savvy and seasoned traveler. A couple of days before the retreat started, we met at the airport in Guatemala City. We began our adventure -- and our catching up -- on the drive to Antigua, a colonial city in the central highlands of the country, less than an hour from the capital. 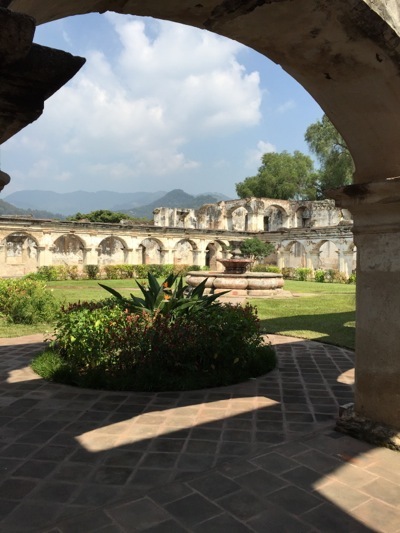 Antigua is the anti-Guatemala City, an easy-going and quaint colonial town. A UNESCO World Heritage site, Antigua's ancient cobblestone streets are lined with Spanish Baroque architectural treasures. There's a sensuous patina to the place, from the colorfully painted, flaking plaster walls, which are evocative of Venice, to the tumbling ruins of old churches and convents. 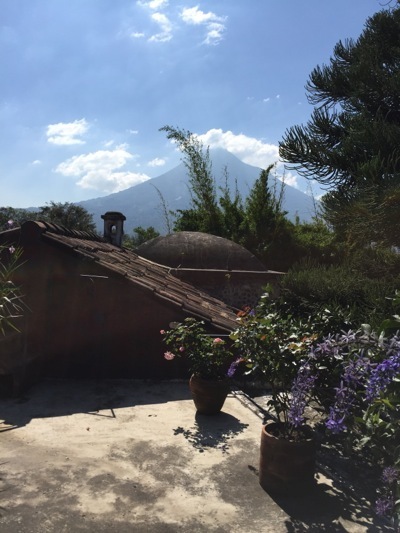 Though I love taking the road less traveled -- and I put Guatemala in that category -- I like that road to end at an extremely comfortable hotel, preferably with great service. The Meson Panza Verde, a chic boutique hotel here fit the bill. Stylishly decorated by the American expat owners, the Meson is walking distance from Central Park, the city's main plaza, yet situated on a tranquil, residential street toward the edge of town, a couple of blocks from where the cobblestones end and the farms and coffee plantations begin. From the hotel entrance or the rooftop patio, guests are afforded an astonishing view of the stately (and active!) Volcano de Aqua. The décor is textural -- stone, copper, tile -- with alcoves and nooks accentuated by greenery-diffused sunlight. Every room has its own personality; our one-bedroom suite featured a large, private patio and local textiles down to the bathrobes, one of which Alison purchased. 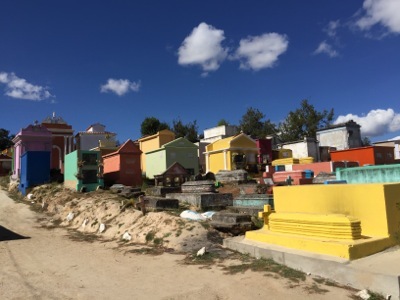 Antigua is ideal for strolling, shopping, stopping for a coffee (though Alison hit the nail on the head when she noted that the terrific Guatemalan coffee is rarely well prepared here), visiting the churches and ruins. 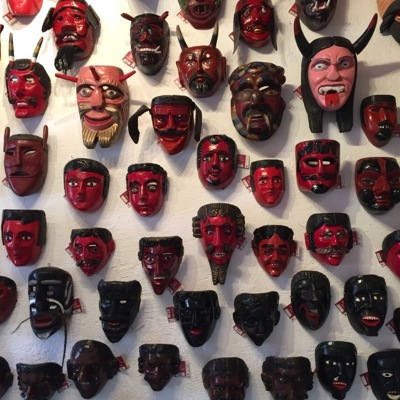 One of my favorite shops was the Casa de Artes, which specializes in one-of-a-kind antique textiles and huipiles, ceremonial masks, jewelry and pottery. I cannot say I was floored by the Guatemalan cuisine, a typical lunch buffet, frequented by locals and served in a beautiful garden was underwhelming and under spiced. But we did have a good meal at Como Como, run by an amiable European couple who source their ingredients from farms just outside town. Our most memorable meal though was at the Meson's semi-al fresco restaurant, which also gets high marks for ambiance, thanks to the musical trio, featuring a Cuban pianist. My first glimpse of Lake Atitlan from the waterside town of Panajachel was disappointing; it was hard to notice anything other than the ugly, Soviet-style 25-story apartment building painted a revolting green. Thankfully, we quickly boarded a boat and sped away, and were soon enveloped by the stillness, glory and power of this fabulous body of water. The boat dropped us at the dock of Villa Sumaya, a retreat center to rival any in the first world. 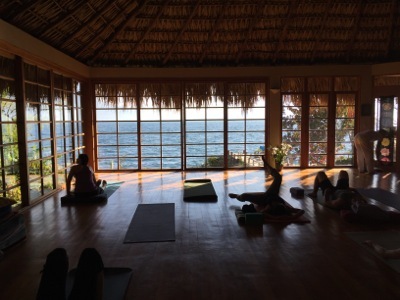 For the next week, we did yoga daily in a studio/temple with exquisite wood floors, a soaring Palapa-style roof and a view out onto the lake and those evocative volcanoes. When we weren't on our mats, James and Alexia from Tejas Yoga in Chicago, which had organized the retreat, came up with fun things to do like kayaking, hiking a volcano, and visiting local Mayan artisans. (It was heartbreaking to remember that a decades-long civil war in the country, which only ended in 1996, left over 200,000 inhabitants killed, many of them the relatives of the indigenous Mayans who live in the twelve small communities surrounding the lake.) Wendy Stauffer, the owner of Villa Sumaya, arranged a Mayan fire ceremony for us with a local shaman. In our free time, we relaxed in the solar-paneled hot tub, walked to nearby Santa Cruz, swam in the lake, dozed in one of the many hammocks on the property or had bodywork from the Villa's talented therapists. The food, mostly vegetarian, was prepared with local ingredients, and was abundant and delicious. One afternoon, Alison and I visited writer Joyce Maynard's sprawling lakeside vacation home in nearby San Marcos. 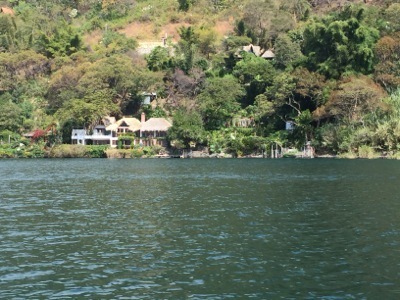 In 2012, Maynard wrote a compelling story about Lake Atitlan in the NY Times Magazine describing how the forces of nature - a landslide, rising lake waters -- inadvertently remodeled her place in 2010. Maynard's original sauna is eerily visible underwater, as is the old dock and stone steps that once led to her property. When she and her family are not in residence, Maynard rents the property. "I'LL BE THE TOAST OF CHICHICASTENANGO. AND ALL DAY LONG MY CASTANETS WILL CLICK." I'd first heard of Chichi -- as the locals call this town that boasts the biggest market in Central America -- from the above quote, a line from a Bye Bye Birdie song. Since that happened to be my favorite musical as a kid, I had to go there. Alison was all in; she still had some serious shopping on her agenda. There is no posh hotel here, but the Hotel Santo Tomas, which has been around for years -- its 80-something year old owner, Ines, is often at the front desk -- was fine for a night in this off-the-beaten-path mountain location. We definitely needed the working fireplace in our room and the next morning were up and out early, ready to spend our quetzales. The town was already bustling with street after street of stalls selling everything from frankincense and myrrh, to candles and hammocks, to hand-embroidered tablecloths and huipiles. All our senses were simultaneously seduced. Exotic aromas emanated from the lines of food stalls, as we swayed to the beat of women slapping small, fat blue corn tortillas. The market is otherworldly and noisy, unruly yet friendly. We were bumped by men in native dress carrying enormous bundles on their heads and ducked out of the way when a holiday procession suddenly jammed the narrow street. In the middle of this hubbub rose the stone steps of Santo Tomas church where women did penance on their knees as others swung urns of smoking, devotional incense. In the distance, the brightly hued crypts of the local cemetery added to the colorful confusion. Culture shock marked our arrival in Guatemala City, after a tranquil sunset ride from Chichi; suddenly we were back to civilization with traffic and pollution and noise. After a week practicing yoga in paradise, neither of us felt like "doing" Guatemala City. Instead we went straight to our hotel, which was next door to the American Embassy and where the embassy houses its visiting dignitaries. The Hotel San Carlos is run by the grandchildren of coffee plantation owners. This was once the family home and its public areas are decorated with lots of sentimental tchotchkes. But the individual rooms and apartments are modern and sleek and have all the amenities -- cable TV, American-style bathrooms, great beds and linens. And the location, in the Zona Viva, the upscale section of the capital, is impeccable. We were in the capital for less than 24 hours and we never left the neighborhood. After a week of vegetarian dining we headed straight to an Argentine grill and gleefully chowed down on steak and chorizo. And, at the Intercontinental, the next morning, we finally found a decent cup of coffee.